Greg Barker specializes in transforming something old into something new, and his home is a prime example of his power to resurrect. By day, Greg Barker works as a customer service agent for American Airlines. But by night—and weekend and whenever else he can squeeze it in—he designs home interiors for a growing list of clients. The Louisiana native got his start in design by buying old furniture at thrift stores, refurbishing it, and then selling it. People liked his work, and his services became more in demand. In 2003, he opened Patina Bleu near the Bishop Arts District to showcase his knack for furniture transformation. Though the home furnishings and accessories store was popular, even earning a nod for Best Light Fixtures from D Magazine in 2005, a too-busy schedule forced Barker to take a hiatus in 2010. 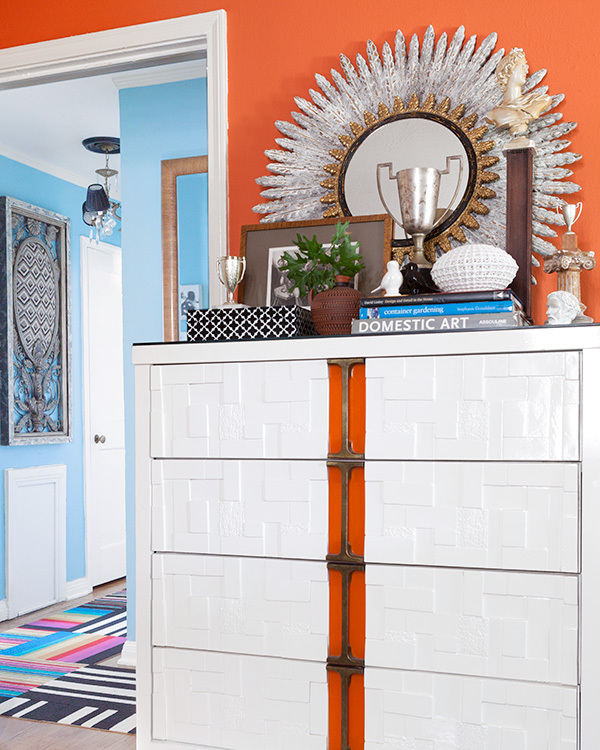 The bedroom dresser is a circa-1960 Brutalist piece Barker lacquered white. The starburst mirror is from an Oak Cliff antiques dealer, the black and white box is from Nuvo, and the floor tiles are from Flor. Patina Bleu may be closed (for now, anyway), but Barker still works his magic on discarded items as often as he can. His North Oak Cliff apartment, in fact, is somewhat of a portfolio of those reinvention skills—the 800-square-foot space features his handiwork throughout. “Everything in the apartment was made or found,” he says. The Italian leather armchair in the living room, for instance, came from a thrift store in Irving, and Barker, of course, had to put his spin on it. Barker found the sleigh bed at a garage sale, distressed it, and added molding and patent leather. The lamps are from 4 Love, and the bedding was crocheted by his grandmother. Barker also did all of the artwork in the apartment, including the large painting above the living-room sofa. He says that particular piece was inspired by abstract artist Franz Kline, who is known for his bold black and white brushstrokes. But when it comes to art, Barker never knows who or what will inspire him next. One corner of the living room features a three-legged arrow table from the mid-1980s, a statue by a master sculptor in Oak Cliff, a metal starburst from Dr. Livingstone I Presume, and a bronze statue Barker found in Italy. The stools in the living room were shipped to Barker severely damaged, but he had his woodworker put them back together. “I didn’t give up on them,” he says. He found the light fixture in the dining room at New York salvage yard Olde Good Things. 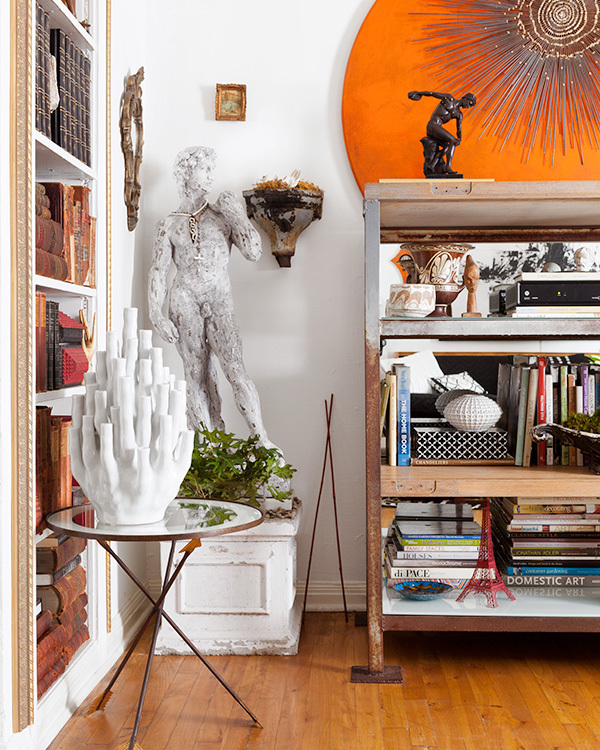 Most of the home’s other accessories are a medley of treasures Barker has found on his travels and uncovered from salvage yards, one of his favorite shopping destinations. 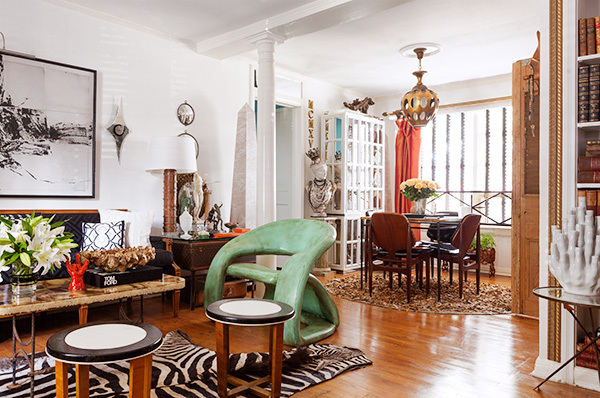 A bread-cutting board from a shuttered bakery, a metal air conditioner grate taken from a New Orleans motel that was being torn down, and doors extracted from the ruins of a fishing shack destroyed by fire are just a few of the gems in the apartment. In other hands, these items would be merely debris. But Barker’s finesse with breathing new life into the old and abandoned gives hope to all forsaken things.